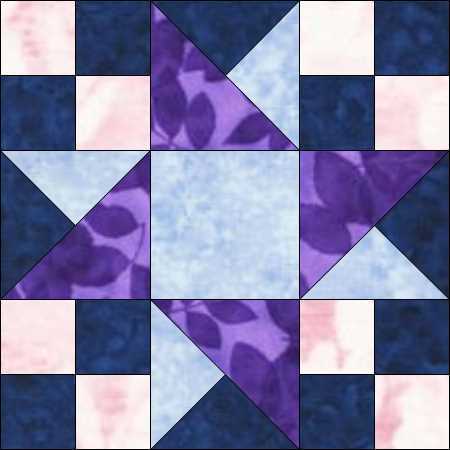 With Square-in-a-Square units added to our Mary’s Triangle units we get a traditional block known as Five Spot. 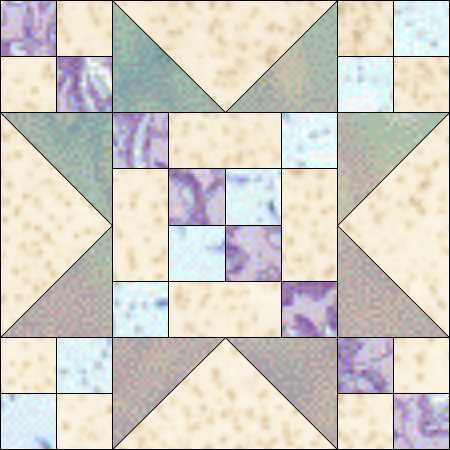 Download the instructions for the block here. 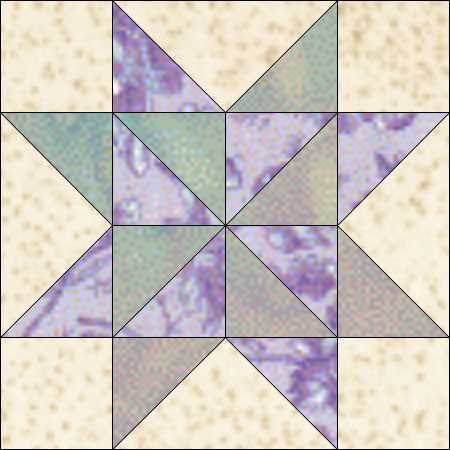 The addition of some careful colouring then gives us the bonus of a star in the middle of the block. You can then have a lot of fun changing the colours around within the block. 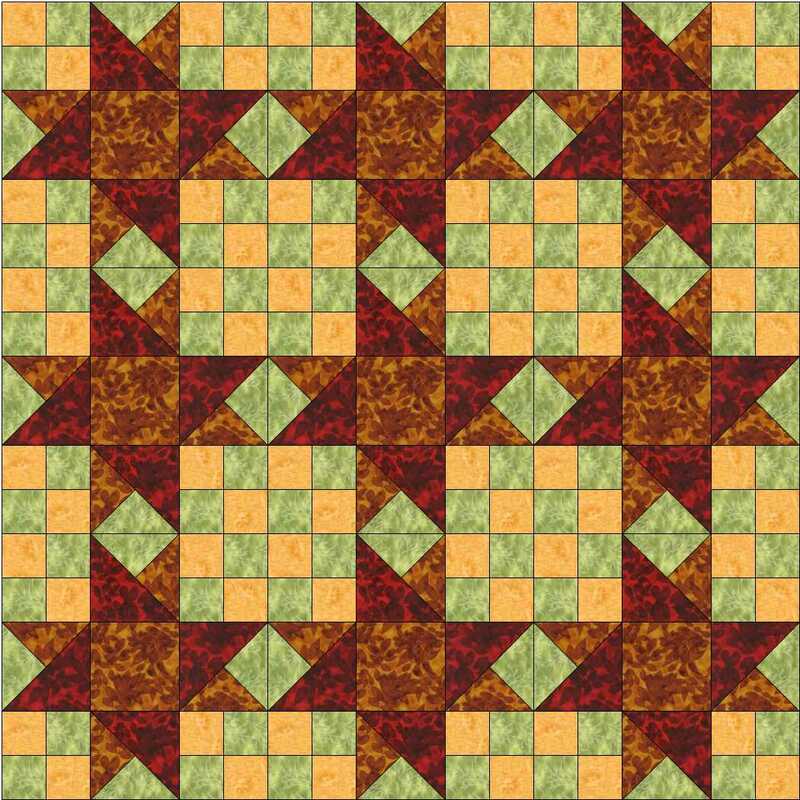 Which in turn makes designing a quilt a lot more interesting too, as just using one colouring on its own doesn’t make for a very exciting quilt . 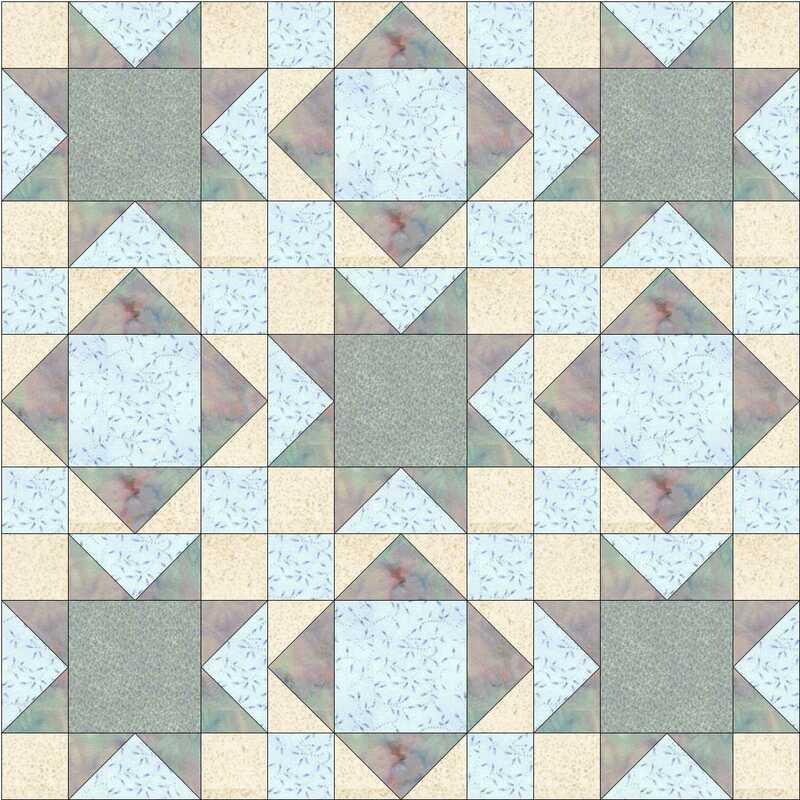 . .
unless we have a bit of a play with the ‘background’ of the blocks and then we start to get something that looks a bit like an Islamic tile design . . .
. . . or we alternate different colourings . . .
or set the blocks on point . 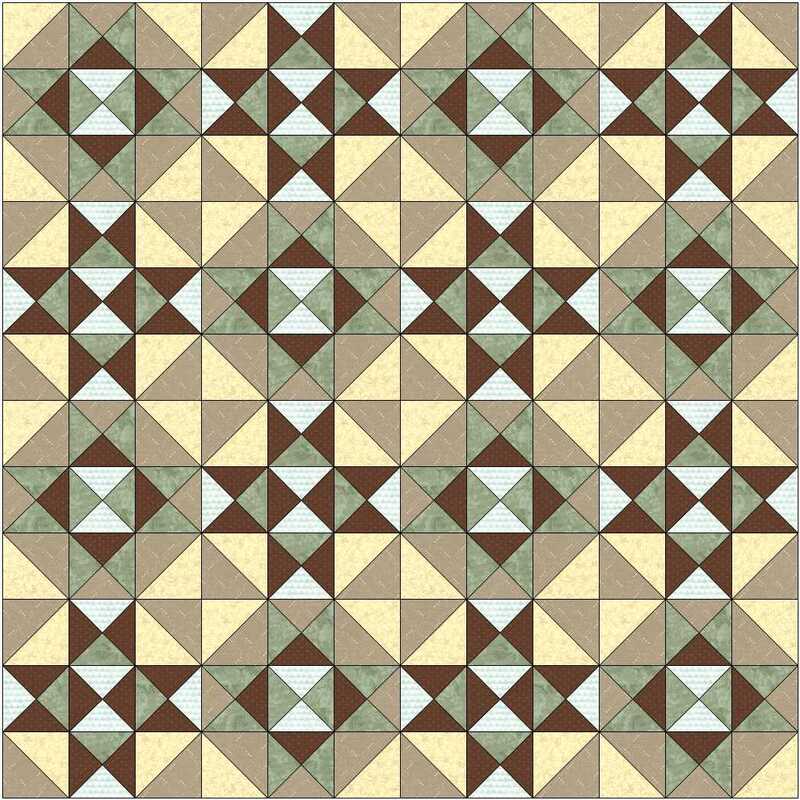 . .
And now some of these are starting to remind me of a Minton tile floor, so what happens if we change to those colours? 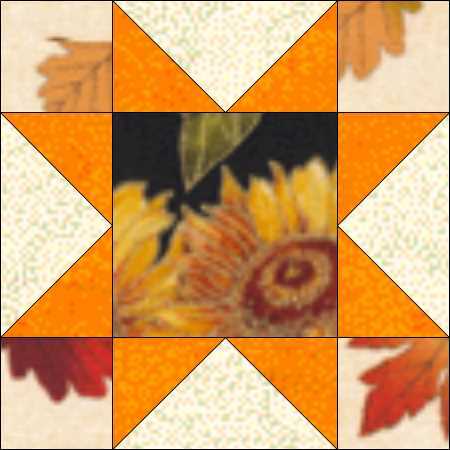 Download the instructions for the Five Spot block here, if you didn’t do so earlier! This entry was posted in Uncategorized on December 2, 2018 by Chris. 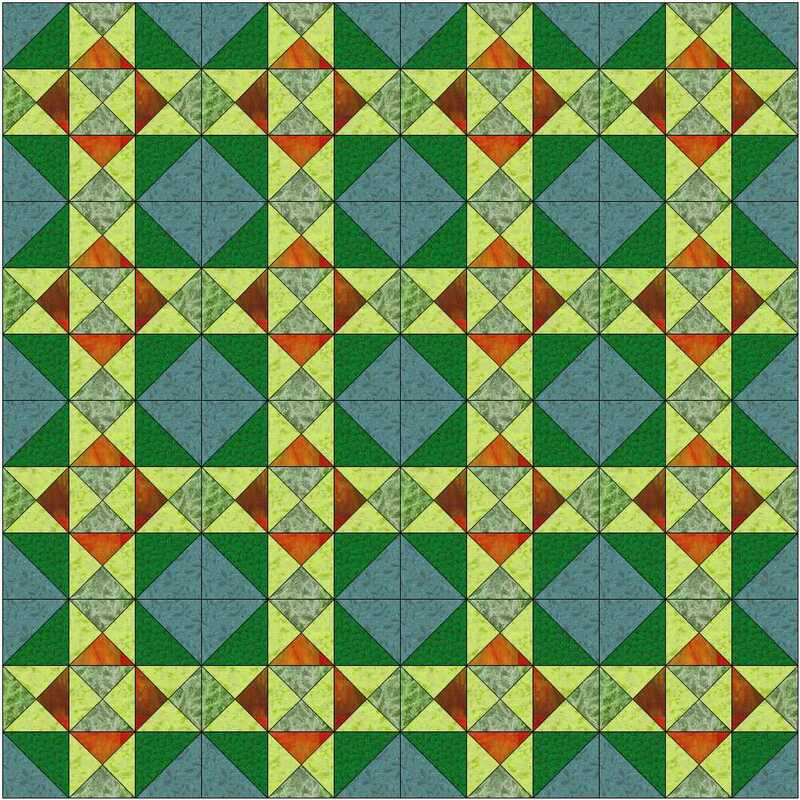 This is another block that uses the 3-triangle unit and is to be found in the library of blocks that comes with ELectric Quilt. 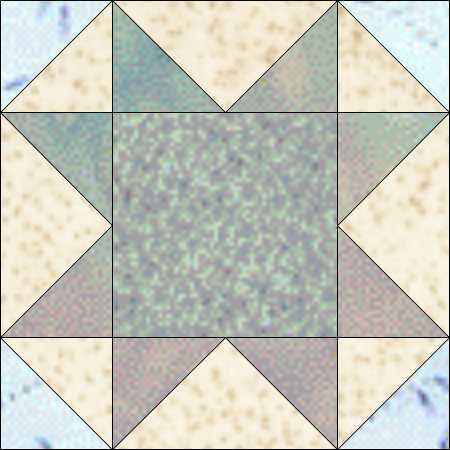 This time the unit is paired with 4-patch units to make a 9-patch block. This allows for all sorts of experimenting with colour and value placement. Download the instructions here. 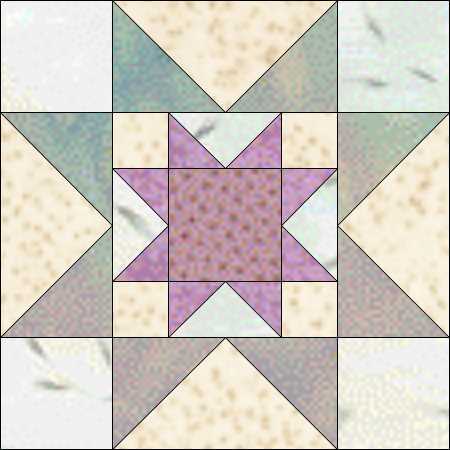 Instructions for piecing multiples of the unit can be found on the tutorials page. These are just a few ideas, there are more in the instructions pages. 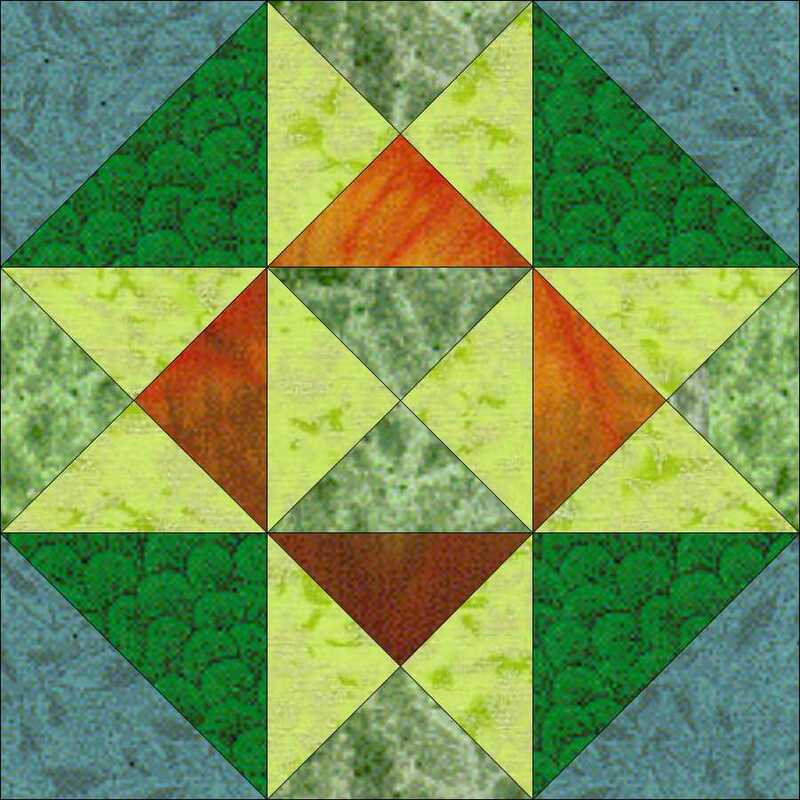 And then you can have fun making quilts as the 4-patch units create paths across or around the quilt depending, again, on how you colour them. Sometimes you can see stars, and sometimes windmills. There are more ideas in the instruction sheet. 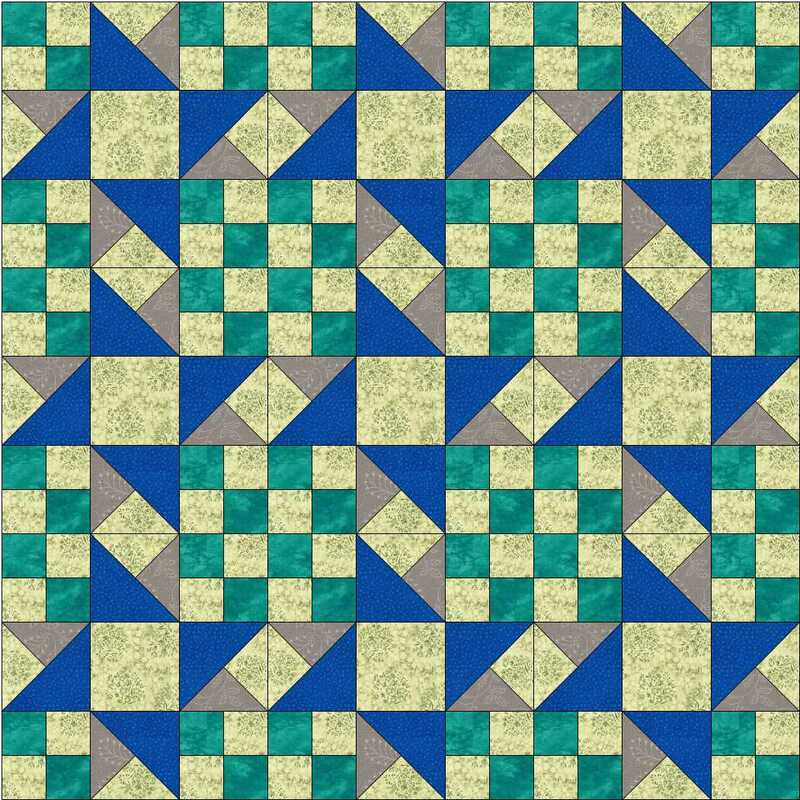 This entry was posted in beginners patchwork, Electric Quilt, free pattern, patchwork patterns, Uncategorized and tagged beginners' patchwork, free pattern, nine-patch block, quilt blocks, simple patchwork on July 16, 2016 by Chris. This entry was posted in Uncategorized on December 23, 2015 by Chris. 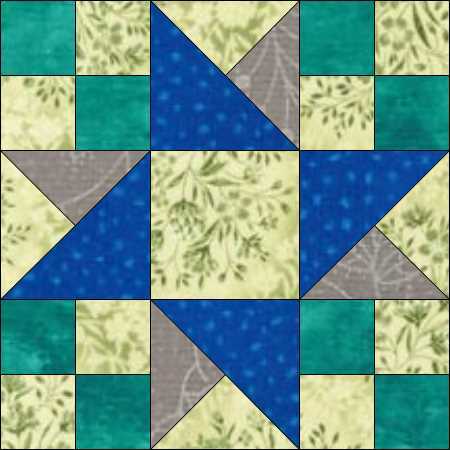 The basic Sawtooth Star is a very simple block – it has 4 Flying Geese units surrounding a large central square and four smaller squares in the corners.You can download the instructions to make a 12 inch block here. 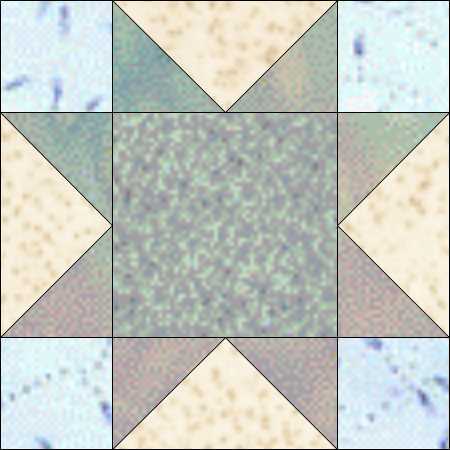 But that central square can be used in other ways. 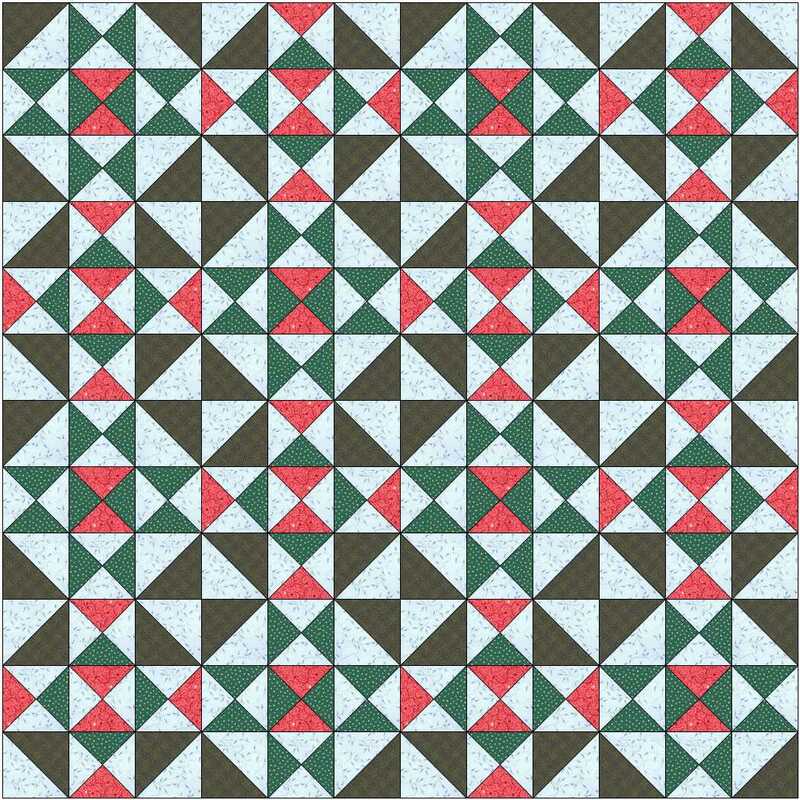 All those simple shapes and blocks we’ve looked at before could be put in there to make a completely different block. 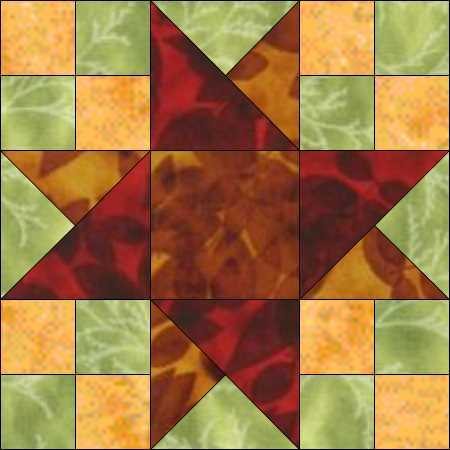 This entry was posted in beginners patchwork, free pattern, patchwork patterns, tutorials, Uncategorized and tagged beginners' patchwork, Flying Geese patchwork, four-patch block, free pattern, quilt blocks, simple patchwork on October 28, 2015 by Chris. 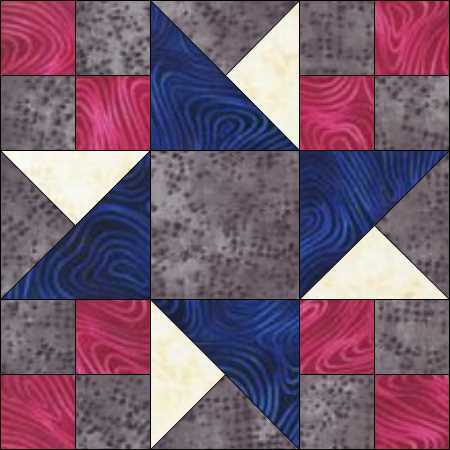 Star X, or The Silent Star, is both a variation of Ohio Star and of the Swamp Angel block. 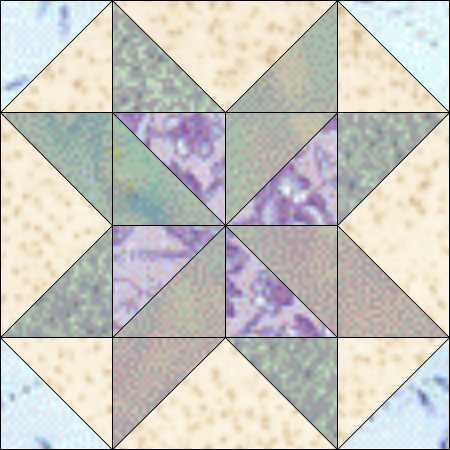 It has five QST units but unlike the last block it has Half-Square Triangle (HST) units instead of plain squares. 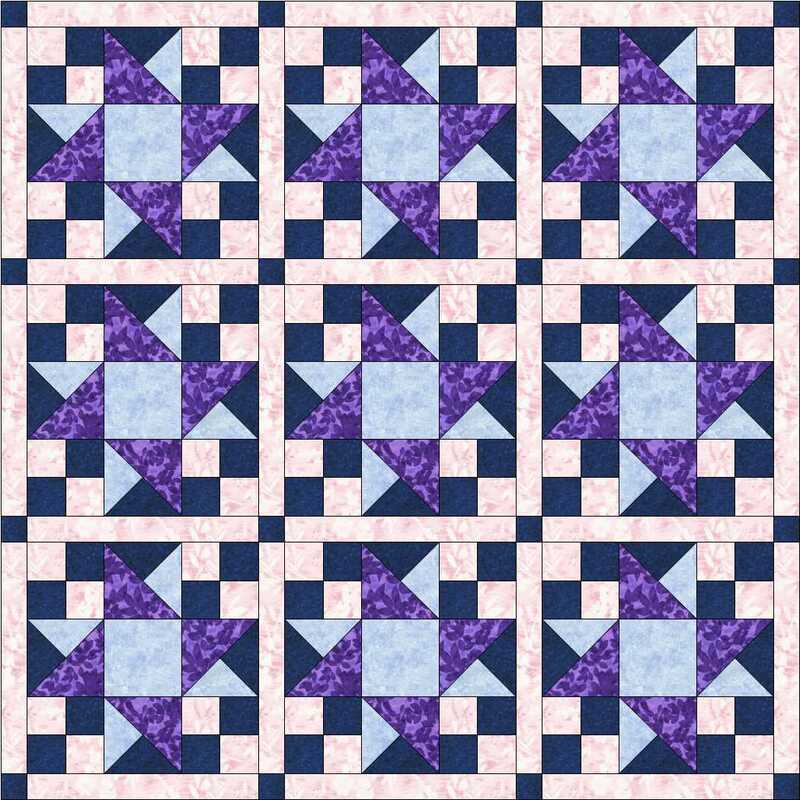 You can download the tutorial pages for both these units from our tutorials page and the instructions for the block here. 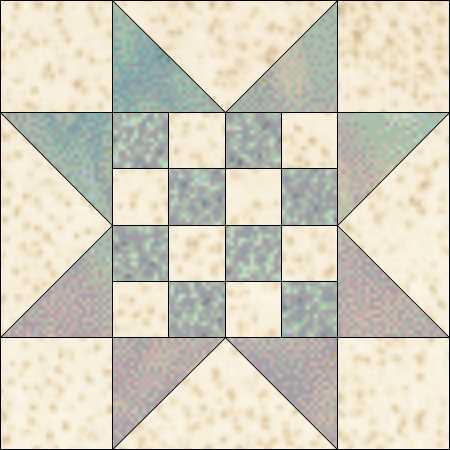 Try playing with the block colourings and settings as before to see what you can make – there are lots of opportunities for play with the shapes in this block. This entry was posted in Uncategorized on September 2, 2015 by Chris. New Regulations on VAT are coming into force across Europe on 1st January 2015. These will affect VAT payable on digital downloads. 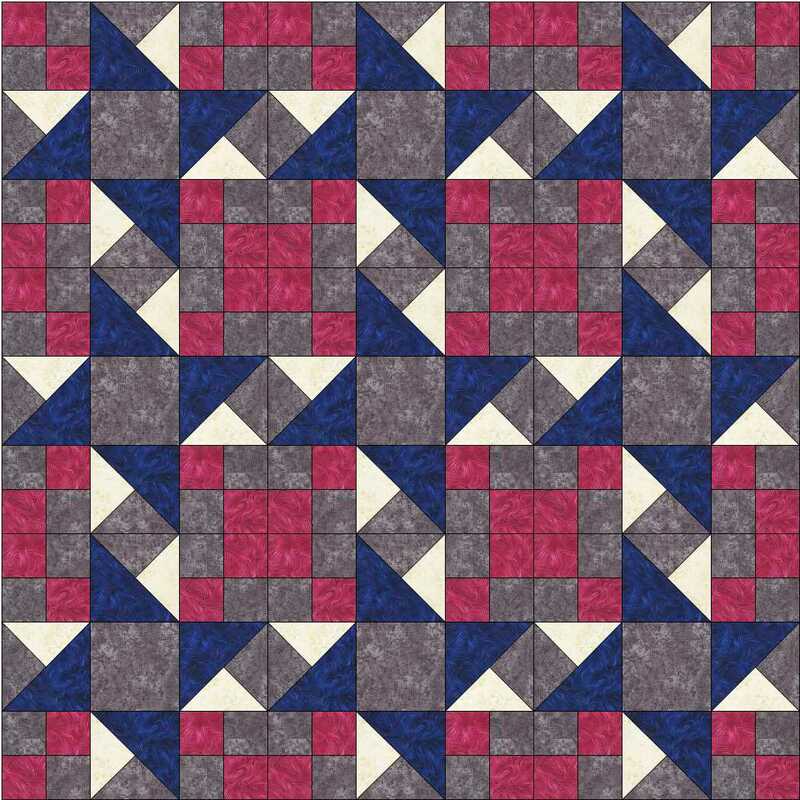 Essentially at the moment if you buy a pattern as a digital download then VAT is payable in the seller’s country – if that seller has a high enough turnover to be registered for VAT. From Jan 1st the seller will have to register for and pay VAT on sales to the buyer’s country. This means (potentially) registering for VAT in every EU country and collecting data on all sales, working out the VAT for each country (and they are all different) and . . . need we go on?! The alternative is to register for VAT in the UK and to submit quarterly VAT returns and then all the hassle of the EU payments is done for you – but you still have to collect all the data and make the returns; and records have to be kept for 10 years . . . Most small businesses – including this one – cannot afford to do this; in time if nothing else and so will be forced to stop selling online. We would still be able to sell a pattern and then manually email it later, as this (we understand) is not governed by the Regulations. As you might expect, a petition has been set up to protest about the unfairness of this Regulation which was designed to prevent large companies taking advantage of differing VAT rules and rates. You can read more about the changes on this website; sign the EU-wide petition on this website; sign the UK petition here; read HMRC Guidelines here; and find a wonderful cartoon summarising the choice facing small- and micro-businesses here. Susan Briscoe has also been writing about these changes and the possible effects they will have – on trade outside the EU as well as within. If you would like to be able to continue to buy patterns, ebooks, photos, videos and other digital downloads from small companies in the EU please sign the petitions and write to your MP. 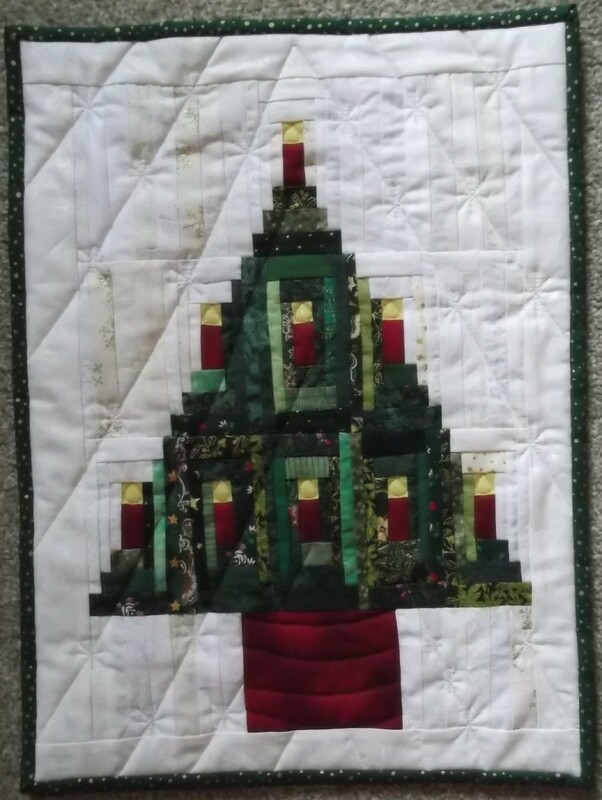 This entry was posted in Uncategorized and tagged micro-business, VAT on December 12, 2014 by Chris.